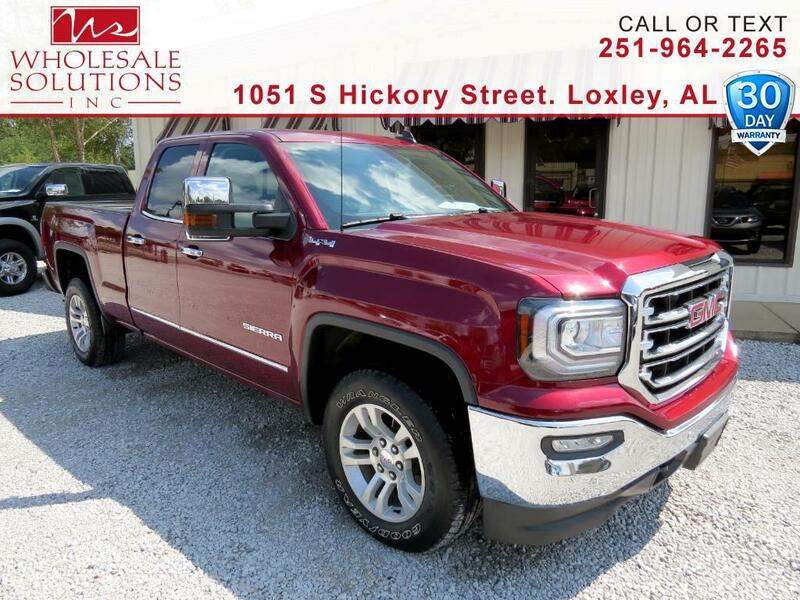 Used 2016 GMC Sierra 1500 4WD Double Cab 143.5" SLT for Sale in Loxley AL 36551 Wholesale Solutions Inc.
** Clean **, ** Low Miles **, *** MANUFACTURE WARRANTY ***, Navigation, *** Nice Truck ***, Sierra 1500 SLT, Extended Cab, EcoTec3 6.2L V8, 20" x 9" Polished Aluminum Wheels, 3.42 Rear Axle Ratio, 6-Speaker Audio System, Enhanced Cooling Radiator, HD Radio, Heavier Duty Rear Springs, Increased RGAWR, Integrated Trailer Brake Controller, Leather Wrapped Heated Steering Wheel, Max Trailering Package w/6.2L EcoTec3 V8 Engine, Power Sliding Rear Window w/Defogger, Radio: AM/FM Stereo w/8" Diagonal Color Touch Nav., SiriusXM Satellite Radio, SLT Preferred Package, Trailering Equipment, Under Body Shield Package (LPO). Odometer is 17926 miles below market average! Priced below KBB Fair Purchase Price! Clean CARFAX.